The opening scene is set in 1970's, some people are talking about a possessed doll and seeking help from paranormal investigators Ed and Lorraine Warren, the investigators are very qualified in their field, they are devoted Catholics and a bit romantic in nature as they believe they are together for a reason which is paranormal. The investigators have a shrine in their house which stores all the artifacts that were connected to the paranormal that they acquired during their work and a priest blesses the room once a month to make sure that the evil spirits stay intact. They travel to different locations educating people by giving seminars and conducting investigations in different places..
Far off is a secluded farmhouse in an isolated area in Rhode Island, the Perron family along with their dog move into a house which they acquired from a bank sale. The family comprising of 5 girls are in full energy setting up the place. Right away strange events begin to happen to them starting with The dog refusing to enter the house and is found dead by the youngest daughter later the next day with reasons not shown. All the clock stop working at 3:07am. Mrs Perron wakes up with bruises on her body and thinks it because of iron deficiency. Then they start to show more intense paranormal events like the kids feet getting pulled while they are asleep, photo frames falling from where they are hung, etc.. While playing a game called "hide and clap" the mother comes in contact with a spirit. During the night while figuring out the sounds she gets locked up in the basement along with the spirit and during this part her oldest daughter is attacked by the ghost. As the days passed on the attacks become increasingly violent and physical. They presumed the house was haunted and seek the investigators help. From investigators the Perrons realize that the house was not but they themself's are the victims. The dark spirits had latched itself onto them. The investigators try to figure out what the spirit wants and helps the family putting themselves at harm. 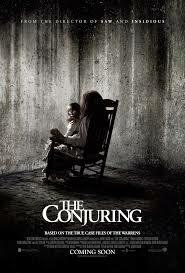 'The Conjuring' you will have a sleepless night or two. Must watch it at least once in the theater to get the full effect of the sound. Soundtrack of the movie called " She saw something"